I absolutely love everything that Michelle Valentine writes. She creates some of the most swoon worthy characters. 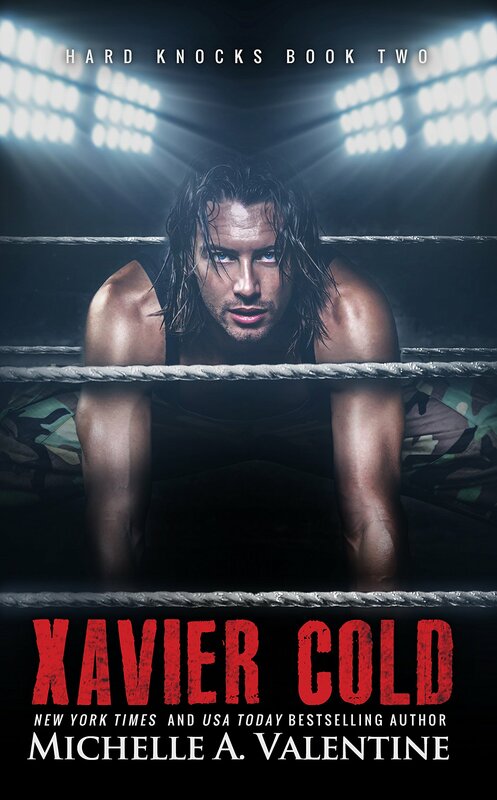 Xavier Cold picks up where Phenomenal X leaves off so if you haven’t read that one I recommend doing that first. Xavier finds himself being taken out of the ring in handcuffs after he beats his opponent unconscious when he loses control. His boss bails him out and is able to get the charges against him dropped but unfortunately for Xavier he ends up being suspended for 3 months and has to stay away from all wrestling related events. This will be difficult for him as Anna is expected to continue working with Rex and Xavier doesn’t trust him at all. Before Anna has to report back to work her and X head back to Denver to spend a few days together. They will be staying at X’s childhood home which stirs up lots of bad memories for Xavier. Xavier goes to a dark place after he starts seeing more people from his past. He feels like Anna deserves so much more than he can give her so when she leaves to go back to work he starts ignoring her calls and texts in hopes that she will find someone better for herself. Will Xavier’s friends be able to pull him out the dark place he has went to or will he fall back into his old ways and lose Anna for good? Anna is not happy about leaving Xavier behind in Denver but she knows she has to go back to work to be able to pay the bills. She is put in some very uncomfortable situations but she pushes herself through them because she knows Xavier will be back before she knows it. She finds out some very exciting news and tries to call Xavier to tell him about it and she gets very upset when he doesn’t answer any of her texts or calls. She starts to feel like he doesn’t want her anymore and isn’t sure what do to. She knows that he loves her but if he isn’t willing to open up and be honest with her she isn’t sure she can continue a relationship with him. Will Anna be able to help Xavier fight past his demons and prove to him that true love really does exist? Will these two be able to make a relationship work or will their pasts keep pushing them apart? I loved the deep connection between Anna and Xavier. I loved all the twists and turns this story took. The secondary characters added lots of depth to the storyline. I really enjoyed the emotional rollercoaster this story took me on. I can’t wait to see what Michelle is working on next!! Thanks for review Sarah it was awesome!